About 6" of cuteness. Like new, from non-smoking household. I am estimating the year of issue as 2011 based on the similarity to what I've seen on Coke collectors' sites. Coca Cola bears. Bear in sweater, bear in driver hat and bow tie, bear in snowflake hat, bear in 2000 vest. All have original tag. Great condition. Would love to a part of your family! This is a lot of 1999 Coca Cola bean bag plush. Our experienced staff will ensure quick order processing & the highest level of service available. OTHER IMPORTANT INFORMATION. Adorable 8" Teddy Bear by Boyds Bears with a Coca-Cola sweater and bottle cap on his foot. Lot of 2 Coca Cola polar bears. They are about 7" tall. Barrot Parrot beanbag Brazil flag Coca Cola bottle 7in 5 up Coke cap tag . Condition is New. Shipped with USPS First Class Package. It is in good condition. If you have any ?. s, feel free to ask. I will not accept SASE. NEW NWT COCA-COLA POLAR BEAR RED SCARF PLUSH STUFFED ANIMAL 6"
This is Coca Cola Collectible Bean Bag Plush polar bear with Striped Shirt and Bow Tie (really a red scarf) #0209. Coca Cola Bears Bean Bag Plush-Bears,Penguin,Seal,Reindeer,Lion,Elephant,Gorilla NWTs (8). International Collection--#0218 Rilly Rwanda (Gorilla), #0219 Masa Mozambique (Lion) and #0217 Clomp Elephant Kenya. Bear resembles a beige color mixed in the white. If you have any ?. s, feel free to ask. I will not accept SASE. Coca Cola Artic Polar Bear Plush Green Vest Cavanaugh Group Authorized 12"
Size: 12". 4153 SW 47 Ave. This adorable little plush is new in its original bag. Coca Cola Plush Design Holiday Polar Bear Christmas 1996 with Tags Coca-Cola 10"
Character Family: Coca Cola. Charater :Polar Bear w/ scarf. Unlimited Amount. This item is being sold "as is". Normal wear. 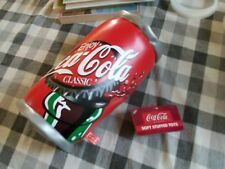 It was made in 1997 by Coca-Cola. It has a red Santa hat and a coke bottle in right hand. The black, hard plastic nose and eyes make it a choking hazard. It is in excellent condition. GRAY 9" CHRISTMAS SEAL. This is a 6" Coca-Cola International Collection Stuffed Plush Bean Bag animal. This is Toro from Spain. This is a 6" Coca-Cola International Collection Stuffed Plush Bean Bag animal. This is Woolsy from Ireland. International series collectible - Oppy the Octopus of Greece. 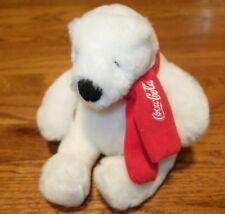 Like new Coca-Cola plush toy collectible - 1999. T oy Lovey. Coca Cola Polar Bear. Red White Scarf. Black Nose. This is a 6" Coca-Cola International Collection Stuffed Plush Bean Bag animal. This is Fannie from Germany. This soft & cuddly stuffed polar bear. To Coca-Cola collectors and bear lovers alike. This is a 6" Coca-Cola International Collection Stuffed Plush Bean Bag animal. This is Heeta from Namibia. Still in plastic and never been opened. 1998 Coca Cola Soda Fountain Teddy Bear Chubby Bearringer Plush. This bean bag plush is a gray seal with green scarf. From 1999 Style # 0203. Polar Bear. White Red Scarf. Condition is used but very good. Plush does show a little wear. Clean with a touch of dust around head.